Today I want to talk about less commonly used and known operators that can be used on integral numbers in Java, Bitwise and Bitshift operators.Bitwise operators most commonly used in masking operations and bitshift operators may be used in encyription or hashing algorithms.I'll try to explain them with some small examples. &(Bitwise and) operator: Used to accomplish "and" operation bit by bit. Note: All the primitive types are signed in Java.Therefore the max value of an int in java is max 2^31 -1 and min - 2^31.That's because the leftmost bit is used for sign and zero is count in positive numbers that is 0000..0000 is used for zero. | (Bitwise inclusive or) operator: Used to accomplish "inclusive or" operation bit by bit. ^(Bitwise exclusive or) operator: Used to accomplish "exclusive or" operation bit by bit. ~(Bitwise negate) operator: Used to accomplish "negate" operation bit by bit. *The result is the 2's complement of three that is negative 3. *The result is the 2's complement of eight that is negative 8. 2's Complement Form:The computers use 2's complement form for the negative values so that the mathematical operations made easily like adding 2 + (-2) instead of subtracting.As an example lets obtain the 2's complement for 3 to get the form of -3 used in computer systems. As you can see, the result in the step 3 is the representation of -3 which we printed out in the previous example as the result of ~a. >>(Bitwise signed right shift) and <<(Bitwise signed left shift) operators: Used to shift a bit pattern to left or right by the given number. If the number is negative the signed shift operator will complete the number with 1 instead 0. Say we want to count the number of ones in a number. To do that we need to find a way to correctly extract the information from each bit of a number. We can accomplish this by using a mask. For example if you mask each bit with 1 using bitwise and operator, only the bits with value 1 will return 1 and other will return zero. We can use the below method which compare the least significant bit in number by 1 and shift the number to right by 1. Note that this is an unsigned shift. When you need masking you can use & operator like below. 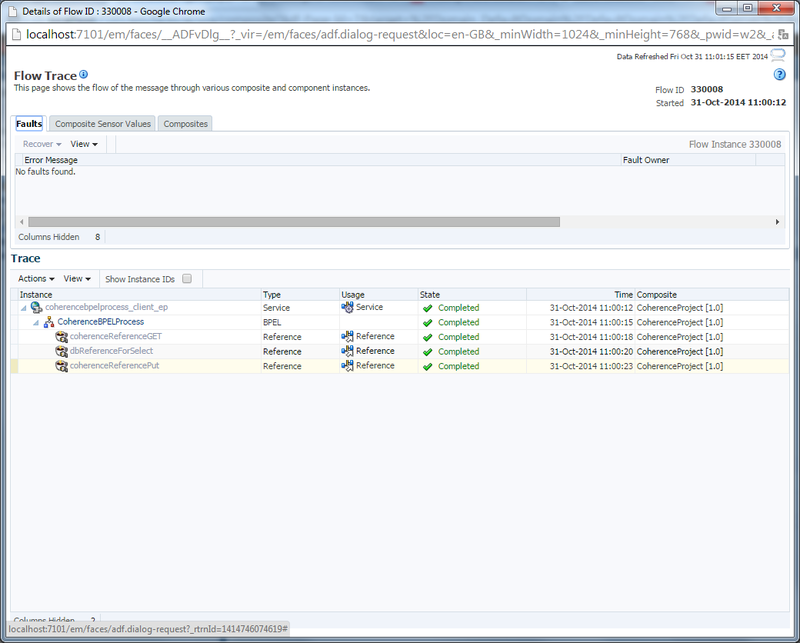 Example: suppose in a byte the right most bit shows whether it's an admin or not. 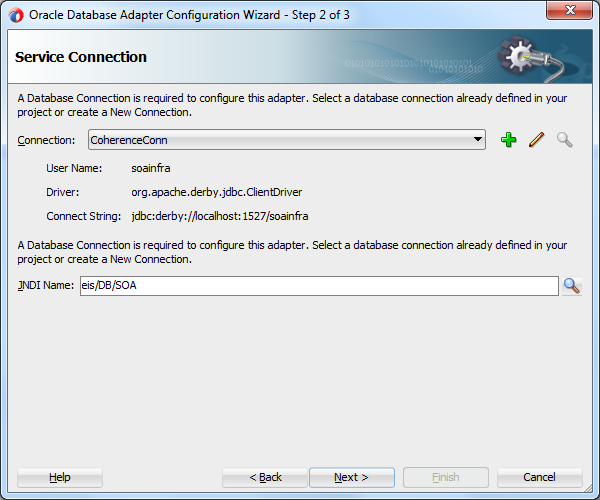 byte readRoleFromDatabase = 3;//say we read 3 from the database for the user's role. You can use "bitwise and" operator to understand a value is odd or even like below. Note: In the real world examples we use byte variables and shows 8 bits for them in the command lines.However in the real world the computers use 4 bytes even for the byte variables because of the memory model of the 32 bits computers.If we really want to use 1 byte for a byte variable we have to use a byte array.Since the byte array itself uses 4 bytes for its memory representation, the byte values in it need not has to have 4 bytes instead they has 1 byte for each variable. I tried to summarize the usage of the Bitwise and Bitshift operators in Java.As I said, they can be used for masking or in encyription algorithms and they have limited usage in Java.You may use "bitwise and" operator for comparing values or checking if it is odd or even, and may use bitshift operators mostly in encyription or hashing algorithms. Today we'll talk about caching capability of Oracle SOA Suite environment using Coherence Cache adapter.In general, cache coherence is a way of being sure about the consistency of the cached data in a distributed cache environment especially in multiprocessor systems.Oracle Coherence makes the data available as if it were a single application server in a clustered environment and serves the data from the memory if it is available in the cache, instead of a database call.By this way it reduces load on database and reduces the overall response time.In addition to the read-only data where we can use the query the data from the coherence cache, it can also be used for the insert, update and delete operations lefting the database operation at a later time where the system is not heavy loaded.By this way, even it can be used as a failover scenario if there is a problem with the database. 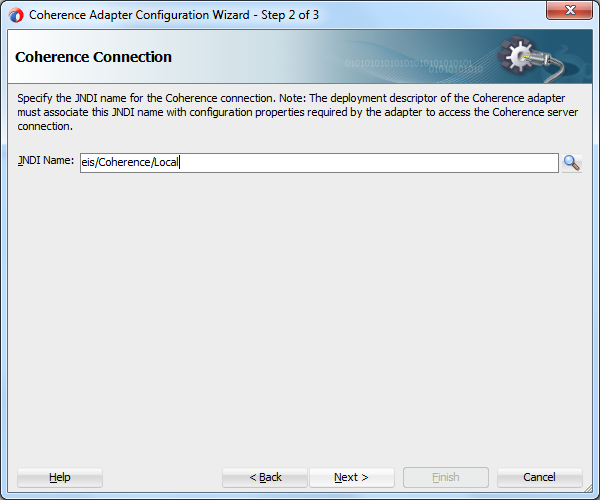 First of all, we have to target Coherence Adapter to our server which is the DefaultServer in our case.To do that, go to the http://localhost:7101/console and choose CoherenceAdapter in the Deployments menu.See in Figure 1. 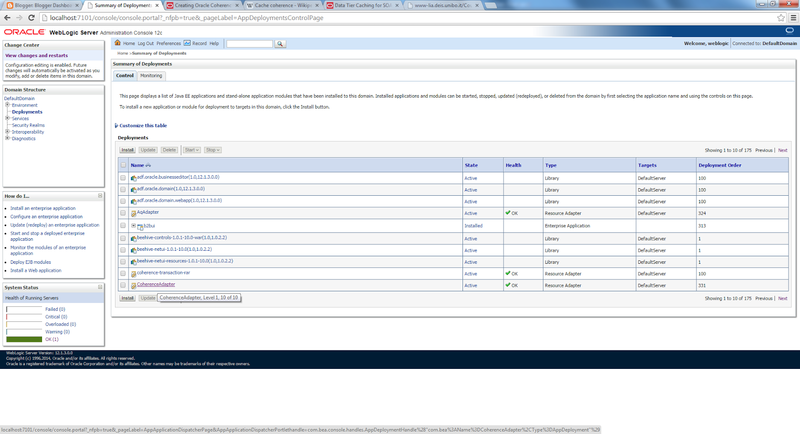 Then, go to the Targets tab and check the DefaultServer as in Figure 2. 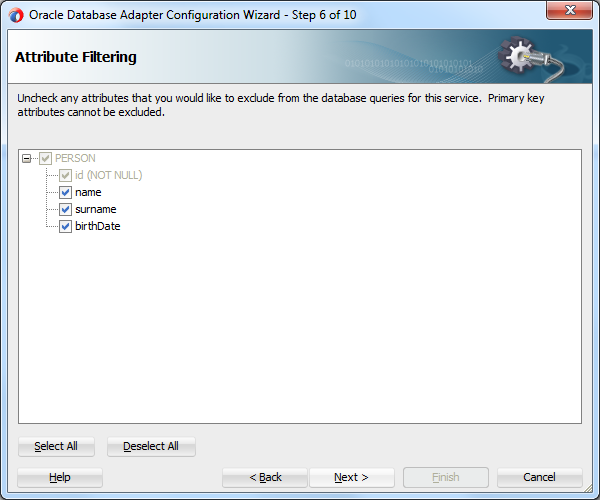 Go to Window -> Database -> Databases and create a new Database Connection like in Figure 3. 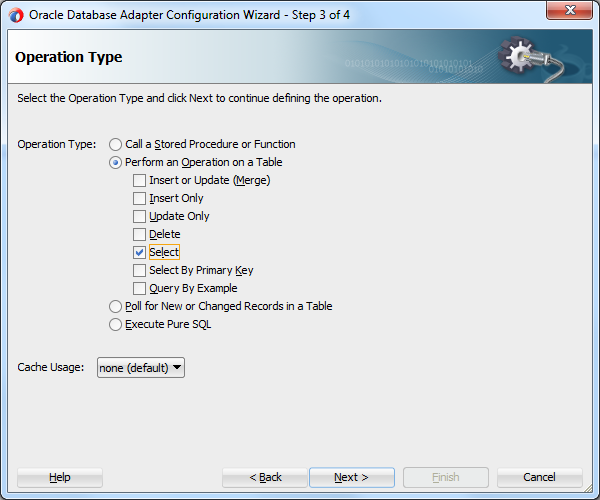 Then, create a new table named PERSON with the columns as shown in Figure 4. 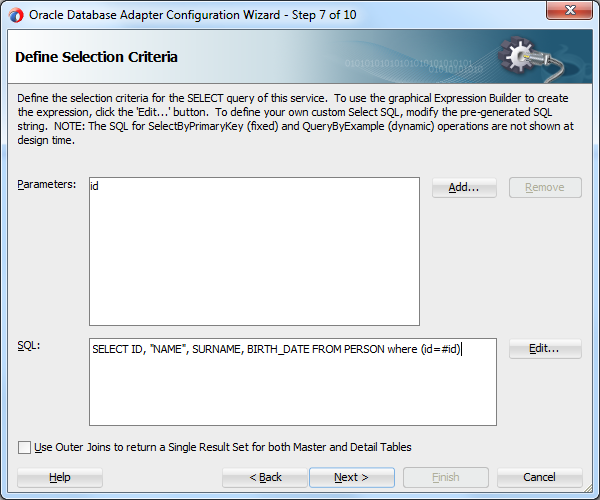 Run the following insert queries in the Tools -> Database -> SQL Worksheet screen. 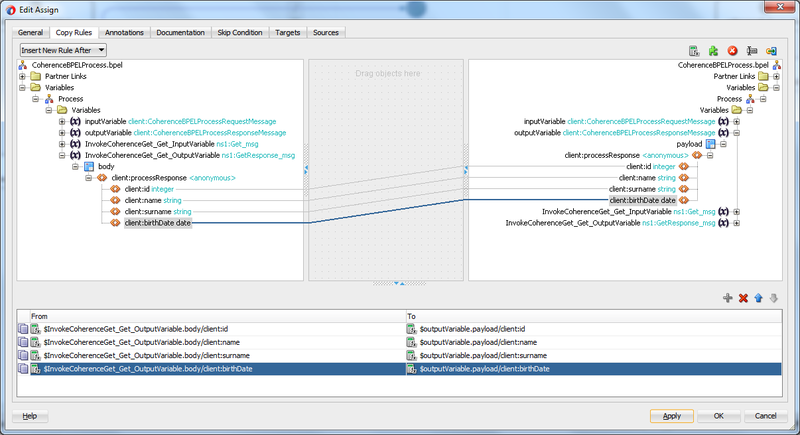 Create a synchron Bpel process in the composite page and change the xsd file as in the Figure 6. 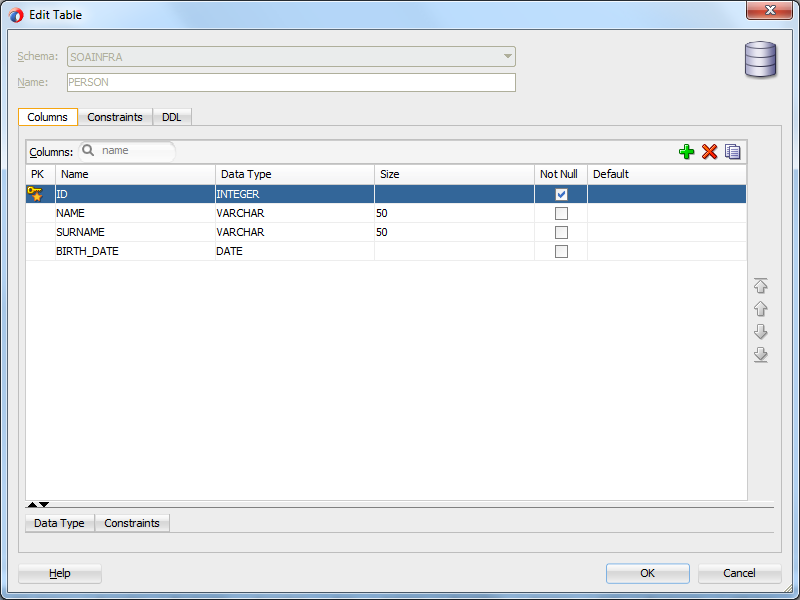 Then, drag and drop a Coherence Adapter to be used with Get operation from the Components -> Technology to the composite editor and rename it like in the following figure. 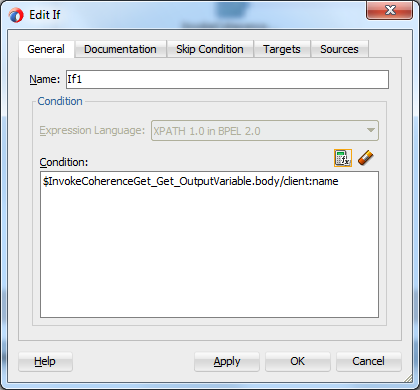 Choose eis/Coherence/Local as the JNDI Name. Choose the Get operation.See in Figure 9. 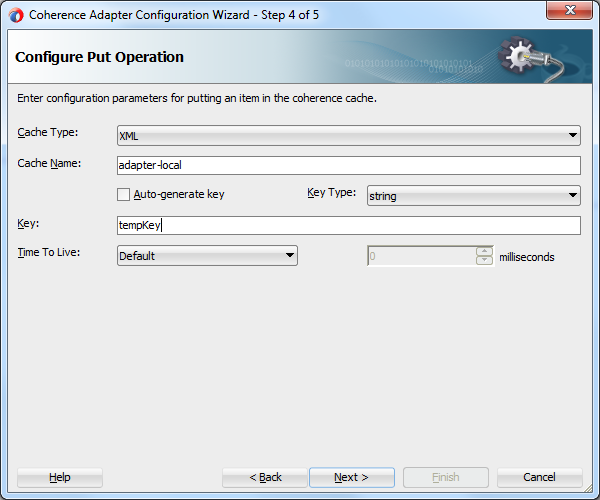 On the next screen of the wizard, enter the cache name as "adapter-local" which is a prebuilt internal coherence cache. 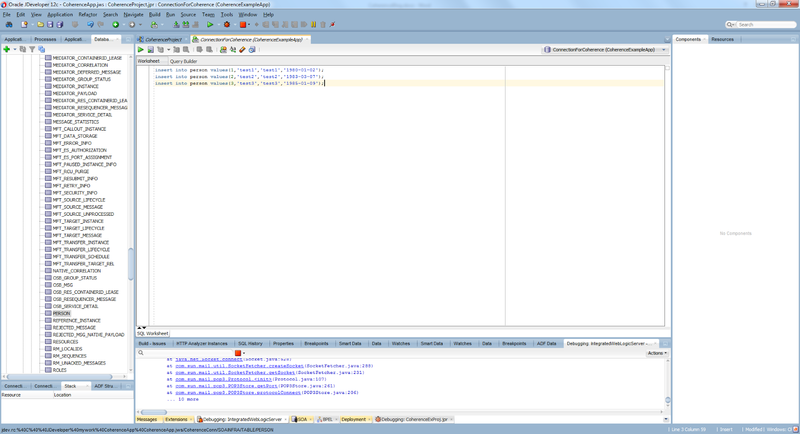 Leave the Key field as empty and ignore the following message, we'll enter the Key value later on. 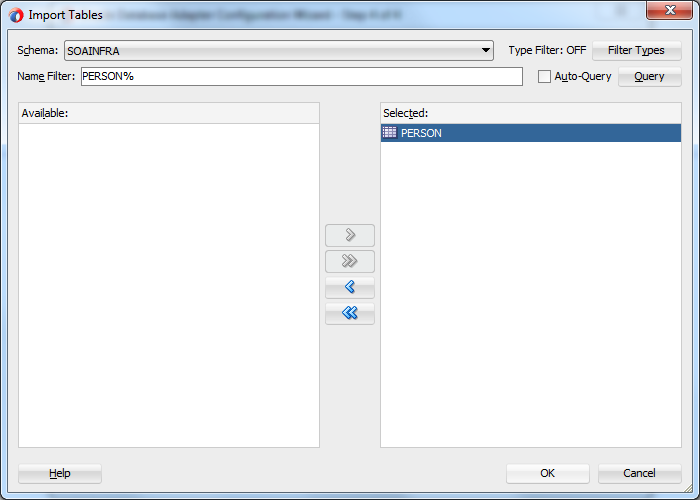 On the next screen, choose the processResponse schema element of the xsd we have defined earlier as in Figure 12. The composite now should look like the following figure. Next, drag and drop another Coherence Adapter to be used with Put operation and rename it. 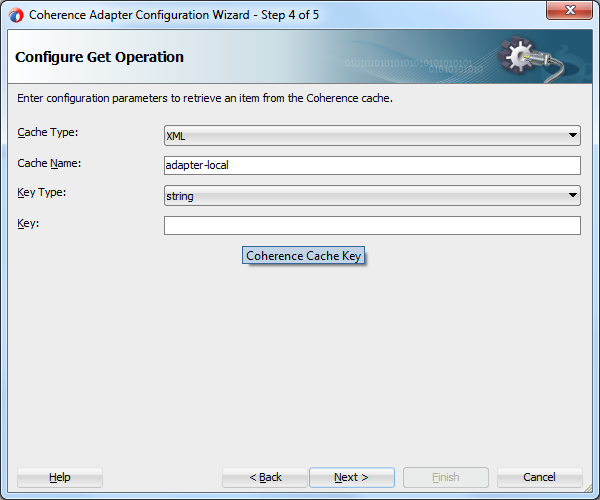 Enter again the builtin coherence cache named "adapter-local", uncheck the Auto-generate key, and enter a temporary random key definition which will be overrided soon.See in Figure 16. 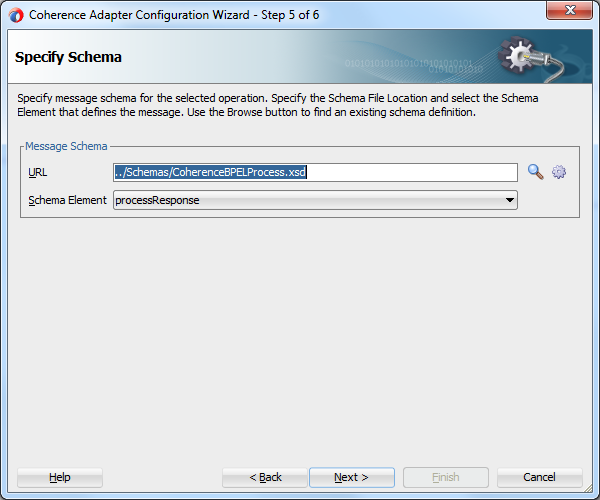 Similar to the previous Coherence adapter, choose the processResponse Schema element of the previously defined xsd file. 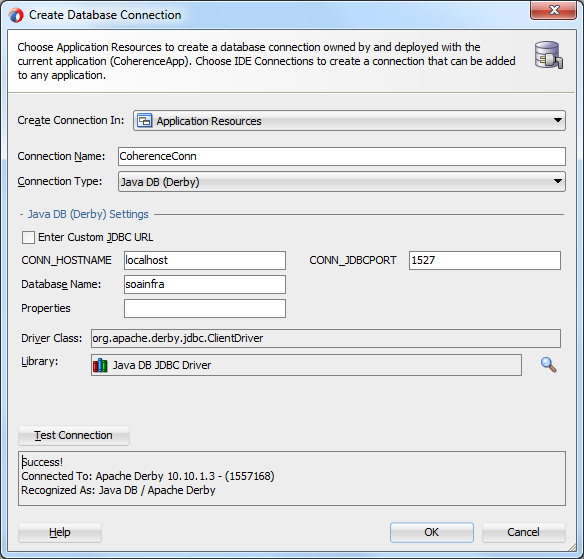 Before go in to the detail of the Bpel process, the final step is to define the database adapter, so drag and drop a database adapter to the composite editor. 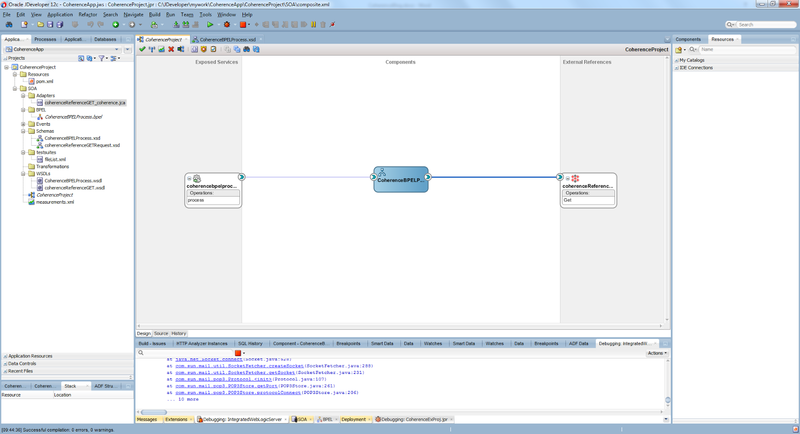 Choose the connection we've just created and enter the builtin JNDI eis/DB/SOA like in Figure 19. Choose only the Select operation on the following screen. Import the table PERSON we've created previously. 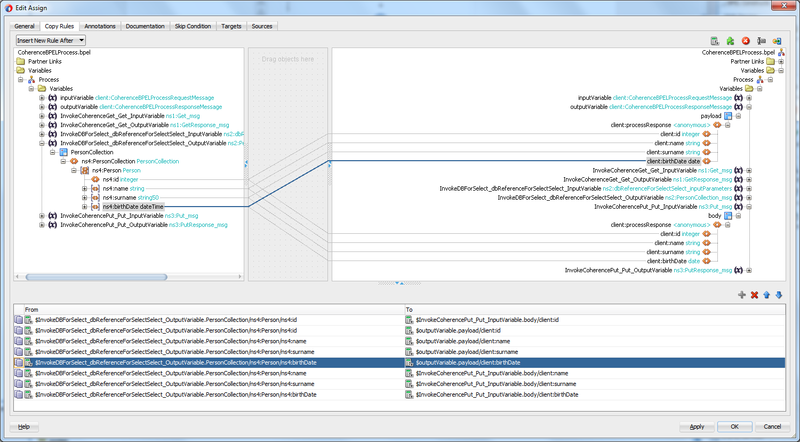 Check all the columns of the table PERSON like in Figure 22. 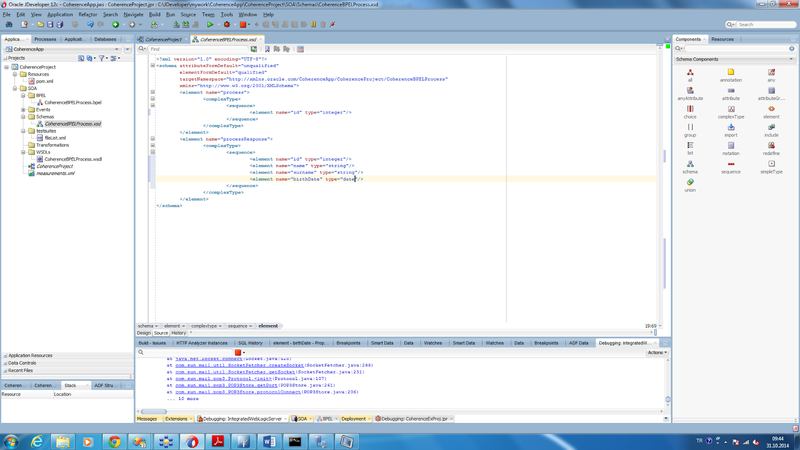 Now, define the parameters and the SQL.We want to select a person with a id.See in Figure 23. At the end we should get the following diagram in the composite page. 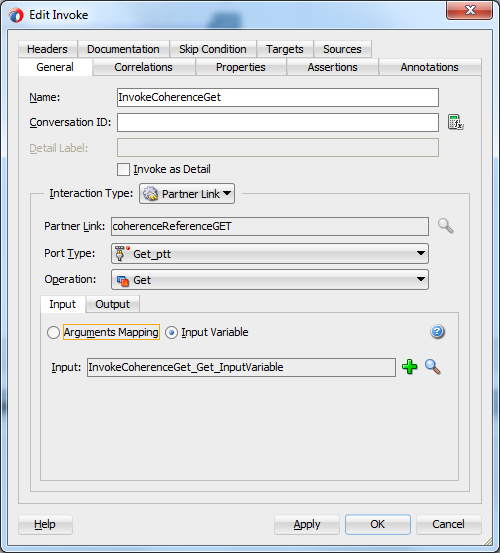 Go into the bpel editor and drag and drop an invoke activity after the receiveInput component.Reference the Coherence Adapter with Get operation from the invoke activity.Then define the input and output variables by just clicking the green plus sign like in Figure 25. 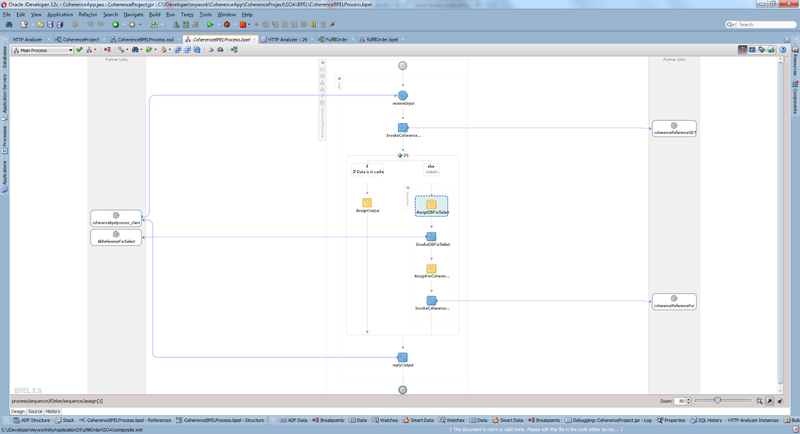 The bpel process should look like the following now. 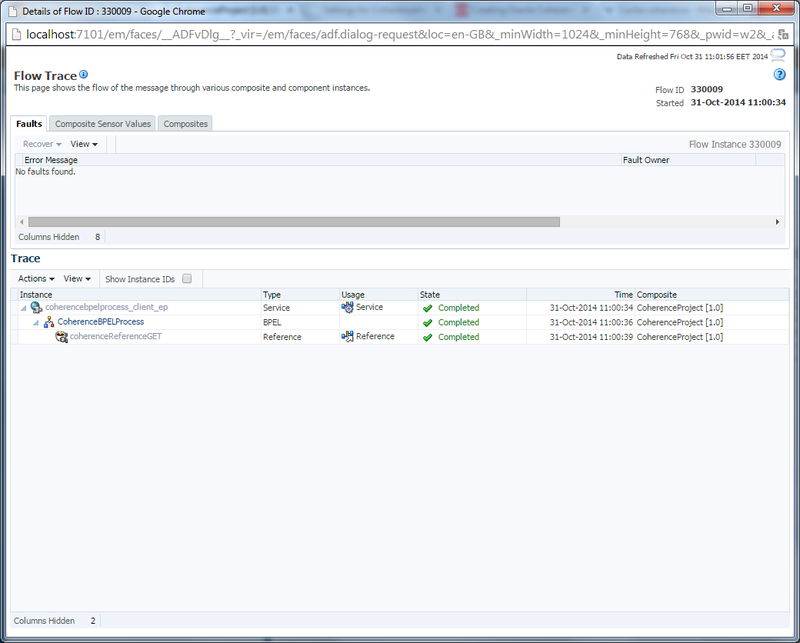 Go to properties page of the invoke activity and click to the green plus sing to add a new property. 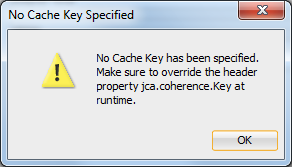 In the opened "To Propery" page choose the jca.coherence.Key property and give its value as the id of the input variable as in Figure 28. 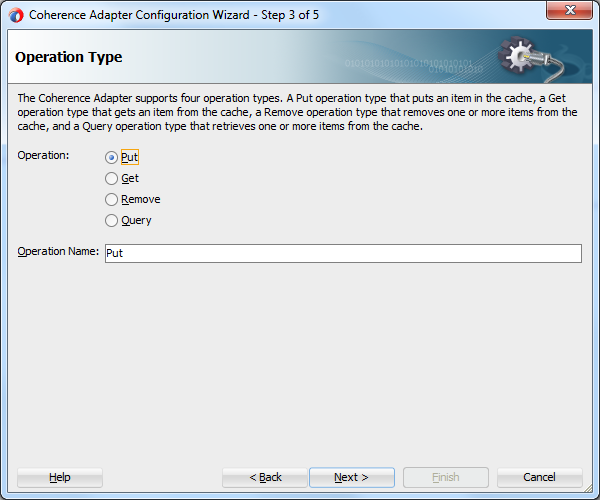 Then, drag and drop an If activity just after the Coherence Adapter with the Get operation and define the following condition to understand whether the data is in the cache.If the name property of the output of the Coherence adapter will not be null that means the data is in cache. 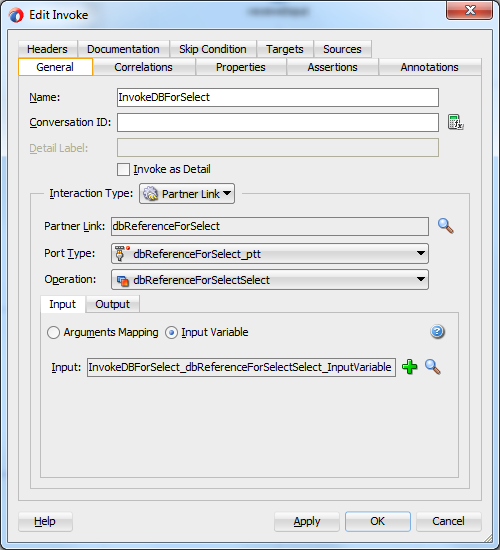 If its returned true from the If activity just assing the output of the Coherence Get Adapter to the output variables by dragging and dropping an assing activity.See in Figure 30. If its returned false from the If activity, in the else part drag and drop an invoke activity and reference it to the Database Adapter we've defined choosing the input and output variables by just clicking the green plus sign as we did previously, and assing the input id to the input variable of the database adapter with the help of an assign activity. See in Figure 31 and 32. 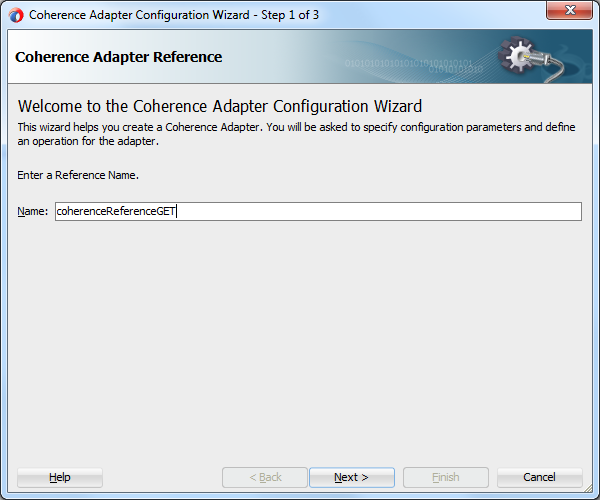 Next, drag and drop an invoke activity referencing to the Coherence Adapter with the Put operation.See in Figure 33. Go to properties page of the invoke activity and click to the green plus sing to add a new property and define the jca.coherence.Key property as the input id as in Figure 34. 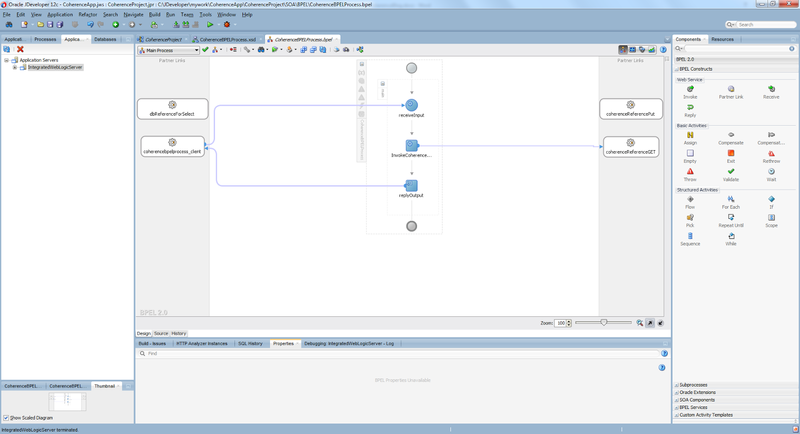 Then, drag and drop another assing activity and assign the output of the database adapter that just select the person information to the input of the Coherence Adapter with the Put operation and at the same time to the output variable of the bpel process to reply to the caller.See in Figure 35. 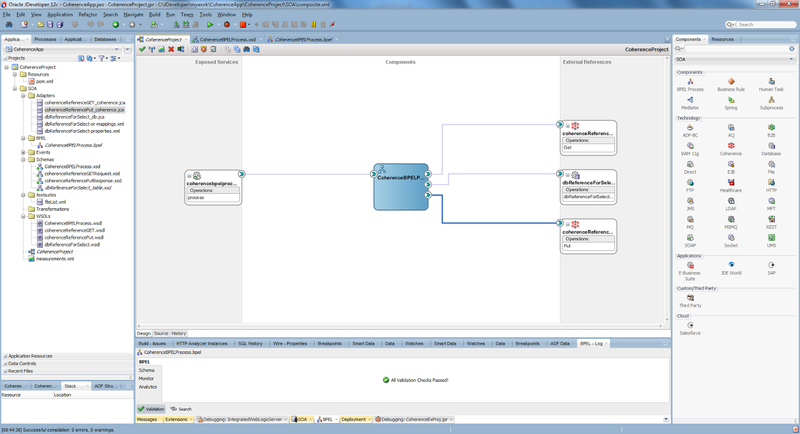 The final bpel process should now look the following figure. 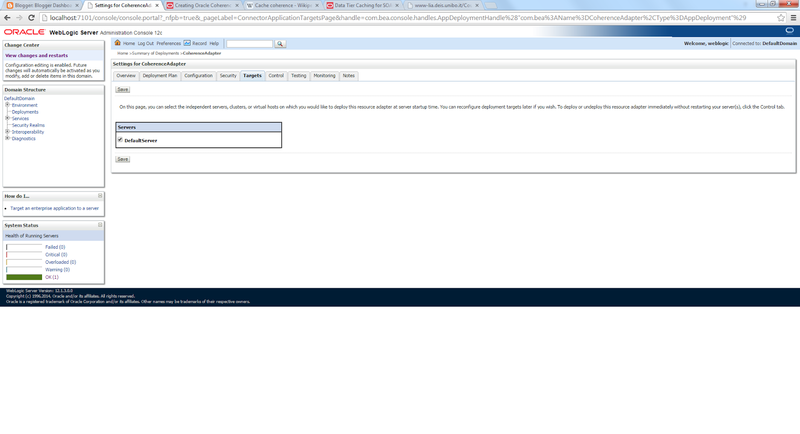 Go to the http://localhost:7101/em, open your project, click on Test and call the service using the same values that exists in the database for example with the id 1. 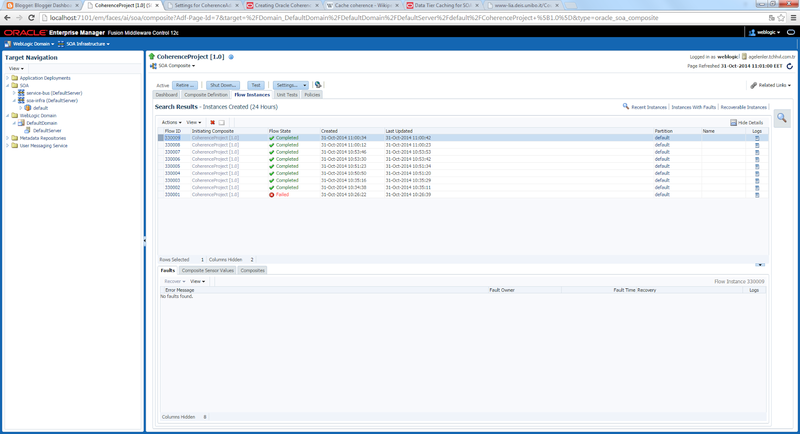 You'll see in the first execution there will be database call, while the later calls will get the data from the cache coherence.You can see this execution paths in the "Flow Instances" page of the enterprice manager as in the Figure 38 and 39. 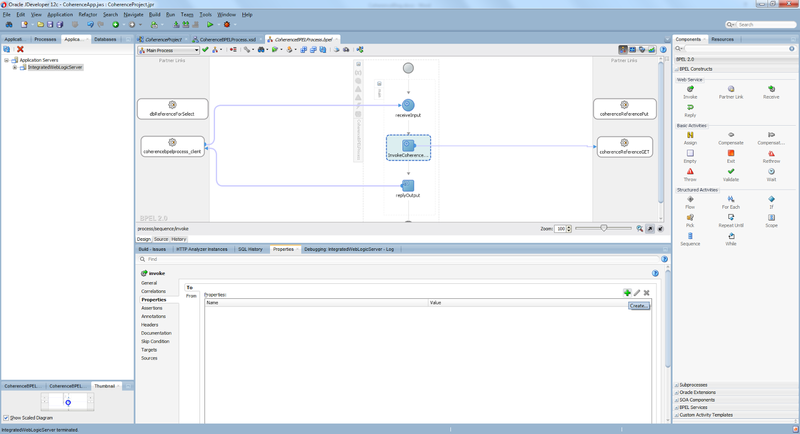 We saw how to use a coherence cache in Oracle SOA Suite environment.The coherence cache can greatly improve performance of an application by serving the data from the memory rather than requesting the database all the time and by reducing the load on database.